It's been a long long few months, life has been changing rapidly and I haven’t known what tomorrow will bring for a long time now. Zephyrs dad and myself decided to take a break, I felt a mild wind of freedom blowing at my feet.. I'm 33 right now, I haven’t yet travelled the world but I’ve been to Bali a zillion times and other than that just one 8 month holiday throughout the Americas years back, well that was about it. I was content not to have ridiculous world adventures, loving being a mum and naturally feeling a grounding pull.. An adventure for me would be more along the lines of living ‘normally’ in a normal house and working and getting on with life as I’ve never lived like that before. I grew up very alternatively & even this area up until a few years ago was like a rainbow bubble, your local doctor probably lived on a commune in a bus in the hills! Life has changed here, but life always does, some places are just slower than others. These days life is constantly changing and it feels like an adventure but just of a different kind. But having this in between time, treading ever so gently around Zephyr knowing that what happens now is absolutely crucial in shaping Zephyrs life as positive as we can, I wanted something to take his mind off the situation, have an adventure, for him and for myself. So with very little money, I would make it happen, our 6 week adventure! Why not?! I booked our tickets for a months time, our friends Siobhan and 4 year old River boy were joining us for a while. I would deal with life when we got back to Byron, which by the way was yesterday..
We all flew into Paris (3 x 7 hour flights later) Its lucky our parenting styles are so similar and we love each other dearly because wow what a few days!!! I don’t know what it is, but Zephyr & River run so so wild together, one minute solo with their Mumma's they are gentle little pixies, then they moment they see each others faces its like 2 hyenas stalking their first prey, just crazy. Impossible to tame and just as impossible to cope with. The jet lag certainly didn’t help. First day in Paris we stayed at a typical Parisian apartment housed in a historical building with a cement box of a courtyard out the back window. Boys woke at 2am & after many David Attenborough attempts (Zephyr doesn’t watch TV, & i'll avoid it to any extent, except in moments when I’m so stressed I could cry, then he gets David Attenborough or possibly surfing) Soo somewhere in between 2-4am after nearly losing my voice from ‘huuuushing’ forever with no results, we went walking the streets of Paris for hours, yes hours, in the dark, parks actually don’t open there until 10am! Yay! Pushed our legs of steel up to Montmarte, along all the pretty and sometimes painful cobblestone streets, and by push I mean we took their prams. I didn’t even know I owned a pram until the day before I left home but knew i'd need it with my giant sized child. What a beautiful day, it really was. Stuff the jet lag, the 2am wake up, everything was beautiful.. Kids got berets, we got berets. We watched the sun rise over Montmarte and were at quaint cafe doors as they opened, sucking the life out of my cuppa tea. Then we got back to the apartment, kids were un-tamable and all of us may have cried at some stage. We have salty farm kids, they run wild and free almost all day long, creeks, bikes, paddocks of flowers forever, mud and more mud, motorbikes and animals, they only know freedom and can’t yet adapt so fast into confinement and the rules and ways of the city life and the serious faced French. We knew we must spend as much time out of the apartment as possible (It so happened to be filled with decorative glass ornaments, yay) So we spent our few days in Paris walking for hours upon hours all over the city & eating a solid diet of baguettes & croissants and more baguettes, oh and ice cream. So much for me being gluten free. That pretty much concludes our Paris trip. We hired a car & headed south. We needed the opposite. 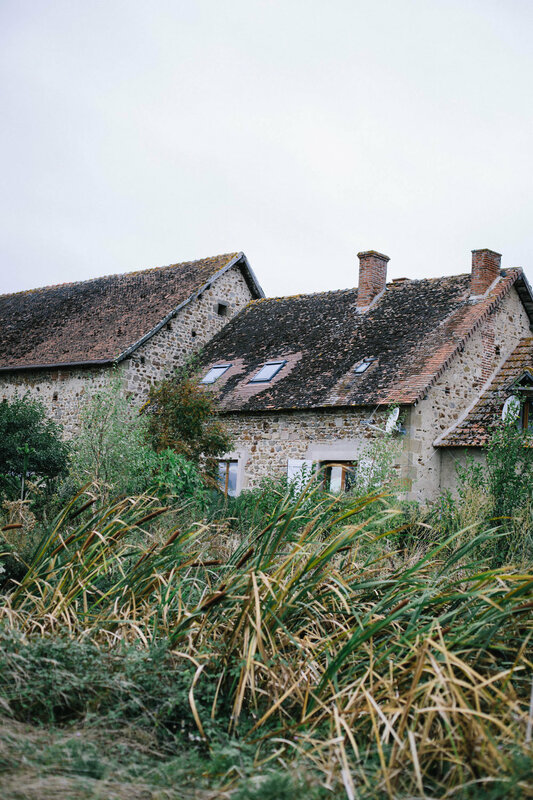 We lined up a work exchange, meals and a room for around 4 hours of work a day, on a farm in the Auvergine area in central France. How beautiful, within moments of pulling up we were all wearing smiles that covered our faces, the kids were back to themselves and adopted a pack of kittens within 2 minutes flat. Huge tight hugs from our new ‘family’ of Annice and John, a 60-70 year old English couple who had lived here for around 20 years. 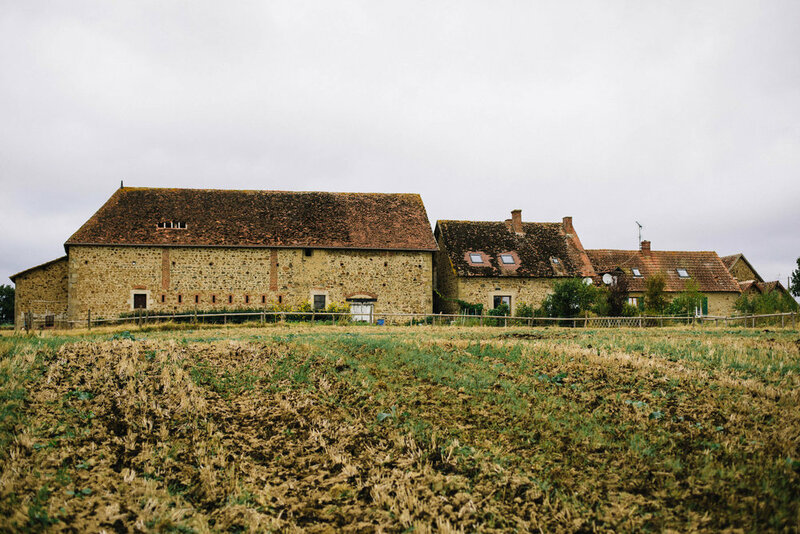 The property was stunning, a very homely BnB in a 400-500 year old farmhouse with quite a lot of dwellings including an incredible old huge barn which they held good old wild barn parties in every so often. We stayed here for just a few days, it did feel like forever and it was defiantly one of the best highlights our 6 weeks away. We were happy to work, I love outside physical jobs, gardening ect, and my body was keen to get moving, so we spent the days painting barn doors, cleaning the chicken pens, digging up and re-planting a ton of strawberries & weeding. We worked together through it all whilst keeping an eye on the boys who were always playing outside near us. It was a relatively safe property for the kids to be left fairly free, similar life to at home but on steroids, either of us are certainly not helicopter parents and are pretty similar indeed with our boundaries. Laughing now because of course, as you can guess there were some, at the time extremely crazy moments but now just hilarious memories of the boys being so cheeky. They carried these kittens around with them from the moment they woke until they bed time, pausing only for meals. The kittens got named Daisy Tree, Ginge-y, Potty & White Sox… Haha Potty!! Zephyr talked to his in a tiny squeaky voice, in which was hilarious to hear after putting up with days of him talking about ‘Remote control Monster trucks…Roaarrrrr’ So, one day after we had just painted these doors bright green in thick thick enamel paint, we were busy working, Siobhan went to check on the boys only to find they had walked the kittens over the went paint doors, while she was grabbing one from River, Zephyr started bathing his in a bucket of water! Washing the paint off.. errrr.. they are probably still green as that enamel paint was made to last a lifetime of wear. Then there was the time they let Genevieve the goat out of her stable for a walk, then they let out the big bunny rabbits from their cages, because ‘animals shouldn't live in cages’.. Many crazy moments but they were the stand outs. Kids will be kids they say, and this is exactly what this wonderful tolerant & welcoming couple said to us. Annice only laughed at most things and kept telling the kids to enjoy themselves and don’t worry about anything, while us Mumma’s were having heart palpitations in the background. She took us to a ‘Brocante’ which is really just a big op shop in France, it was in their rural town and I brought myself a beautiful linen hand stitched slip dress and some 70’s leather working boots, I literally took the shoes off my feet and donated them so I could walk out of there in my new boots! Zephyr got a new ‘life proof’ jacket, to withstand mud, rain, cold, wind and to act as a blanket if need be. That cost me about $8 all up. This countryside was filled with sunflower fields, they were unfortunately just dying, but it was a dramatic and special sight often driving through them all. We loved working outside with the beautiful surrounds and the donkeys watching us. We worked hard, and had brekkie lunch and dinner with the couple. Their generosity and openness was outstanding, it really was. On the first night we were there they had some friends over for dinner and we listed to them tell tales of their travels and the things they saw and people they met. Doing these work exchanges is such a wonderful way to travel, to actually stay with locals (even if they are not technically 'French’) sure, you have work, but thats just part of the experience and the things you can learn by doing that is just something you cannot buy. Kids were absolutely devastated to leave this farm. Have to admit I was a little as well. We headed Deep South, to the east, closer to Italy. We spent the day walking around Nice, only a day yet it felt like much longer. At first glance from the highway looking down on Nice I almost backed out of stopping there as it looked so modern and resort. Not what I wanted. Luckily we drove in and I fell in love with it, sure, it was very resort but with very historical village vibes thrown in, in a big way. The air was fresh from the sea being nearby & the sun was hot, much warmer than Central France. We walked down all the dark tightly woven alleyways filled with fruit stands, tourist shops & pizzerias nestled together. We ate huge ice creams and the boys played in the square while we had pizza for dinner. The sun was setting and we were off to our next work exchange adventure which was at the foot of the Alp’s, only an hour or so drive. The sky was dark & the mountains approaching, kids draped in a slumber with their heads resting on luggage in the back of the car. We called to tell the family we would be staying with that we were close. He advised us just to look out for his touch light flashing in the valley below the mountains, just ignore GPS and you’ll find us eventually he said. Hmm.. Our tiny bubble of a car was weaving in and out beneath cliff faces on a road that seemed impossible that another car could potentially pass us on, but yes they certainly did & how terrifying it was every time we saw headlights approaching, I think I didn’t take a breath until they had made it past (Its been 5 weeks since this happened, & now I know I can proudly say I feel I could successfully drive a truck through Mumbai & be calm) Finally found our man with a torch in the middle of no where, off the edge of a steep cliff, boys were asleep so Michel our family man carried a sleeping Zephyr over the 50 metre long rope bridge that is the entry way to their incredible property.. The blackest of black nights, we had no idea what we were walking into, we could hear the water rushing below so so loudly and walking across that bridge was exciting & extra mysterious! They gave us a tiny wooden cabin at the back of the property to stay in. We had one single bed each to share with our boys, cosy cosy..
We woke up in a tranquil paradise, a pretty and wild area with a raging river rushing though the property lined with pebbles and black sand. The views to the mountains all around us was simply majestic, no other word. 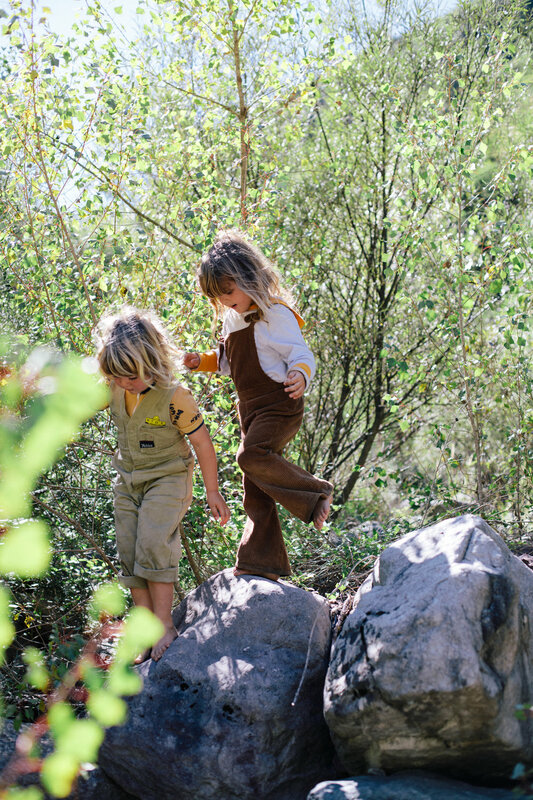 This French-American couple and their 3 young daughters called his place home, yoga teachers and spending their extra time creating a bio-dynamic heaven on their properly. The boys played all day in the garden and by the river, there was also the most beautiful treehouse made from collected small logs set high in the tree overlooking the river. Siobhan decided she would do the gardening while I watched the kids and took photos of the place for the couple. The girls were close enough to our boys age, with cute little bob haircuts, they were bi-lingual and had the most polite and sweetest voices (and eyes!!) I have ever heard. There is something about kids speaking softly in French, it just melts my heart. The Aussie accent can be so rough sometimes, friendly and funny, but rough. These girls 1, 6, 8 were homeschooled, well ‘un-schooled’ & what I enjoyed so much while staying at this place, was chatting to their Mumma about parenting, birthing, breastfeeding, schooling or un-schooling.. She told me the way of things in France (& her original home of America) the obstacles and advantages of raising children alternatively in France. The way they are running their property was incredible and defiantly a huge inspiration and it opened my chain of thought (sustainability, eating organic, growing our own, community spirit) even more and I can’t wait to put in some of these practices when I finally settle in a home. I got a lot out of the few days we stayed here. The boys adored it just as much as we did. This area was defiantly somewhere I would go back to in a heartbeat! It was truly beautiful and remote yet still so close to Nice. If only we had had the time to go for a big bush and mountain walk.. It was a dream even just smiling that fresh mountain air. Now off to Italy, a few stumbles in getting there but we do make it eventually. Made it to Florence after some hire car glitches, an un-eventful stay in Geneva, 2-3 days of train travelling, taxi's & much walking.. We had about 3 days here and spent most of the time riding bikes around, dinking the boys on the back, so much fun. Stuff the pram pushing, we go further & faster on bikes! And boys are happy to be merrily perched on the bike racks on the back. Could never do that in Australia! River did get his feet caught in the spokes but we still pushed forth, nothing was gonna stop me from biking this city! We found a delicious vegan restaurant & ate everything they sold, this was like heaven for us (Siobhan is vegan and I’m just veggie) We saw some beautiful cathedrals, couldn’t tell you which ones as I was mostly caught up with my eyeballs stuck on the kids climbing on the outside walls of them and the policeman strolling over to us… but they were amazing. The carousels in France & Italy are just amazing too, so the boys averaged at least one a day while we travelled. We also ate more and more ice cream as the days rolled on.. Always instigated by myself. I don’t even buy normal ice cream for Zephyr at home, only the organic pure fruit no additives ones sometimes, this trip I was on a food bender for sure. Florence was an interesting city, but a city, and I can only handle a short time in a city, I suppose all the cigarette smoke that filled air was getting to me. We said our goodbyes to Siobhan & River as flew out to Germany.. Just me and Zephyr for another month of Italy & Spain..